The Scots and the Irish have had a profound influence on the Appalachian area, which includes West Virginia. Known for their strong faith and their spirit of adventure, it's not hard to see why they migrated to the hills of West Virginia. If you listen to authentic Appalachian music, you'll hear the influence in the songs and instruments brought from home. And in mid-March with the celebration of St. Patrick's Day, everyone is Irish! Below are 8 best places to celebrate St. Patrick's Day in West Virginia where you can raise your glass and get your Irish on! Known as social gathering spots, pubs have always played an important part of small towns and Meagher's Irish Pub in Bridgeport, West Virginia, is just that and more. Every day visitors can treat themselves to delicious renditions of Irish favorites like corned beef cabbage eggrolls, Irish nachos, or a Guinness float or stay with traditional favorites like bangers mash or shepherd's pie. If you want a buffet breakfast that will wake up your taste buds, attend the annual Kegs Eggs. Sponsored by the Lewis County Convention & Visitors Bureau, the Irish Spring Festival in Ireland, West Virginia, celebrates the return of spring with an official Flag Raising Ceremony, Pot O'Luck Dinner, and parade. Along with the opening events that weekend, there's an Irish Jig Square Dance, a scavenger hunt for kids, Irish Road Bowling, and the coronation of the King and Queen. And if you're interested in unicorns, gremlins and shmoos, you've come to the right place! Held at The Harv Arena, part of the Mountaineer Casino, Racetrack & Resort in New Cumberland, West Virginia, this event is the annual fundraiser for CHANGE, Inc., a local community action group that seeks ways to support programs and services to those with financial needs in the area. This year's event features plenty of entertainment, food, and fun. If you want to celebrate St. Paddy's Day and support a worthy cause, this is the event for you. Promoted as the biggest St. Paddy's Day celebration around, the East End Pub Crawl in Charleston, West Virginia, was named a Top 20 event for 2016. Hear live Celtic music, enjoy free trolley rides, and participate in the Shamrock Challenge while you support the continued improvement of this diverse business neighborhood. Come to the St. Patrick's Day Parade and Festival in Mount Nebo, West Virginia, and support a great cause. The organizers of this annual event raise money for the community through the parade, festival events, beauty pageant, and the Leprechaun Ball. In the past 11 years, more than $250,000 has been raised to support local services like the fire department and ball teams according to Steve Brown, co-organizer and owner of The Tractor Bar where the parade begins. Come celebrate St. Patrick's Day and support a worthy cause. Come out and enjoy great drinks and food in a comfortable atmosphere. In addition to favorites like Pat's Reuben, the Dirty Bird, and honey pecan salad sandwich, you'll enjoy live music and drink specials that will get your heart pumping and your feet moving. Prepare to dance the night away and celebrate St. Patrick's Day at McGovern's Pub in Wheeling, West Virginia. Besides traditional and lively music and some of the best food and drink around, the Annual Highland Games will be held here, but fellas, you must be wearing a kilt to participate! 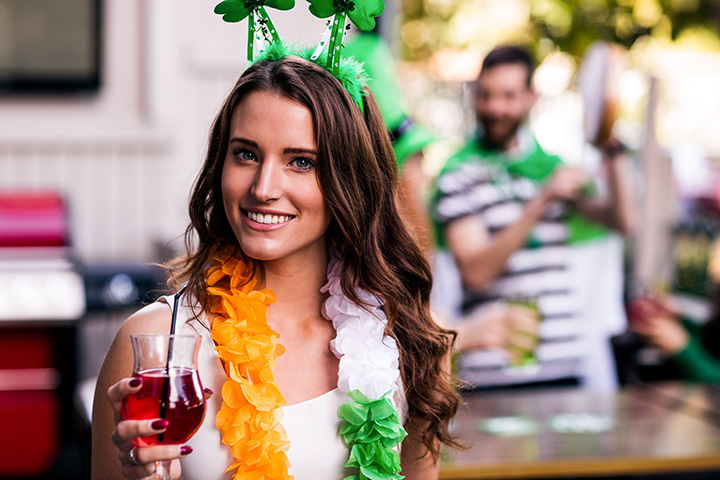 Come celebrate St. Patrick's Day at the Preston County Inn in Kingwood, West Virginia, and enjoy great Irish favorites like corned beef and cabbage, kidney pie, traditional Irish stew, and shepherd's pie. Complement your feast with a pint of green beer and a dessert of Guinness cake. Make sure to RSVP, though, since space fills up quickly.